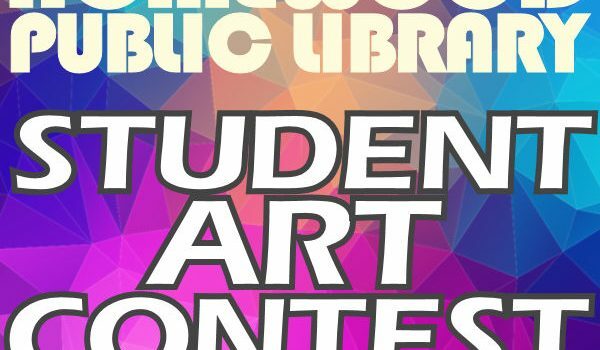 (K-12 grade) The Homewood Public Library seeks to encourage and recognize the artistic talents of local Jefferson County students. Students may submit up to two original works of art produced within the last 12 months. Pieces must be exhibition ready and weigh less than 50lbs. Artwork should be dropped off in the Children’s Department by Friday, March 22, with an entry form attached to the back of the work. Artwork will be judged by a panel of local artists with 1st, 2nd, and 3rd place winners selected for various grade categories. Due to limited space, not all artwork will be selected for display. Accepted entries will be displayed in Homewood Library’s Ellenburg Art Gallery from April 1 through April 26. An opening reception will be held on Monday, April 1, at 6 p.m., where winning artwork will be revealed. Entry forms can be downloaded from the library’s website. For more information, please contact Judith Wright at jrwright@bham.lib.al.us.